Cost is $100 ***Special Discount: $65 non-member price, $39 range member price (add $15 for each additional student). - Purchase a firearm and have an instructor teach you how to shoot it. Use of firearms is included, ammunition provided at an additional charge. - Have one of our instructors give you a tutorial on the shooting of several firearms that we provide. This is a great opportunity for the student who is unsure as to what firearm is best for them. The use of the firearms are provided at no additional cost. 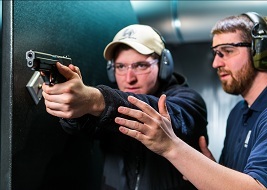 Decide ahead of time which firearm is for you when you have personal range time with one of our instructors. Purchased a new firearm? One of our instructors will help acclimate you to your new firearm (includes instruction in acuracy, cleaning, and anything else you want to know).